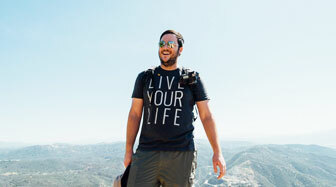 After visiting Desert Christ Park I made the 4 mile trek up to Pioneertown. 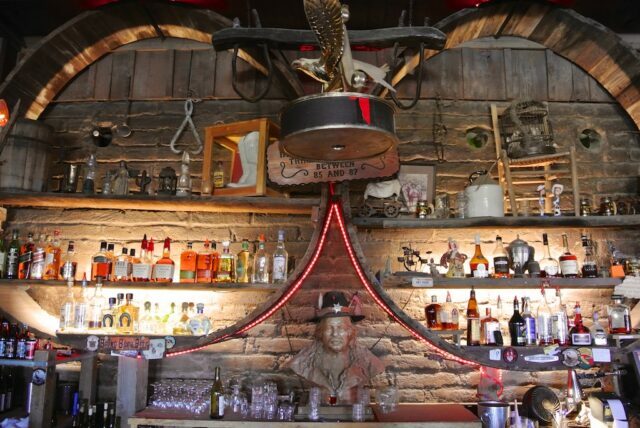 This unique place was once a living movie set, but one of the main reasons people come today is for the music and BBQ that is present at the stellar Pappy and Harriet’s Pioneertown Palace. I stopped in for a lunch and here is my review. 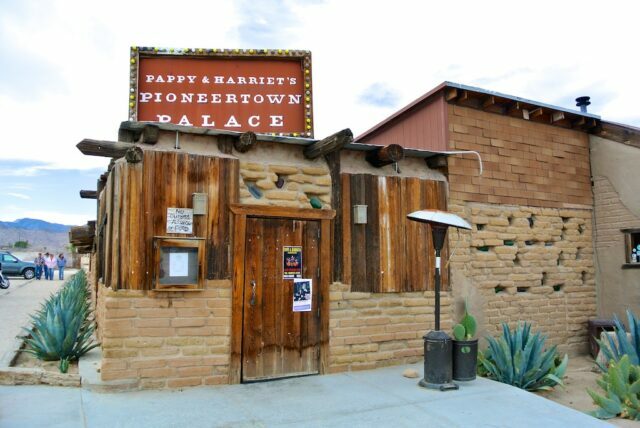 In 1982, Harriet and her husband, Claude “Pappy” Allen, opened “Pappy&Harriet’s Pioneertown Palace”. 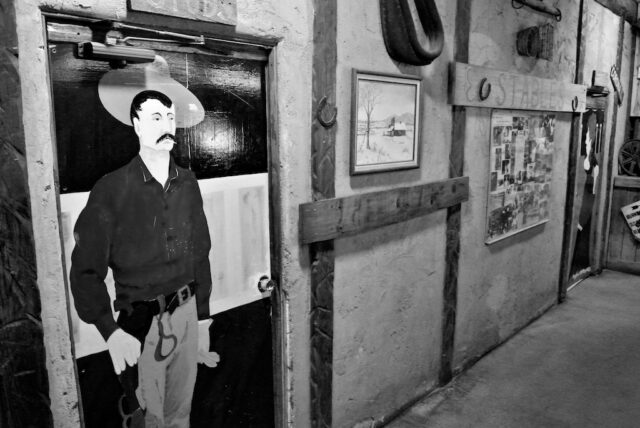 With family style Tex-Mex cuisine and live music featuring Pappy, Harriet and their granddaughter Kristina, P&H quickly became a local favorite with all walks of life getting along under one roof! Pappy died in 1994 and his friends and fans flew from all over the world to be at P&H for a celebration of his life.. Victoria Williams, a good friend of Pappy and touring partner wrote the song “Happy To Have Known Pappy” off her critically acclaimed record “Loose”, that talks about that day. Harriet sold the bar to a family friend who gave it up after a few years. Enter Robyn Celia and Linda Krantz, two New Yorkers who loved P&H and wanted to see it returned to its glory days. The girls bought the club in 2003 and have done just that. Musicians from Robert Plant to Vampire Weekend to Leon Russell to Sean Lennon and many more have graced the P&H stage. 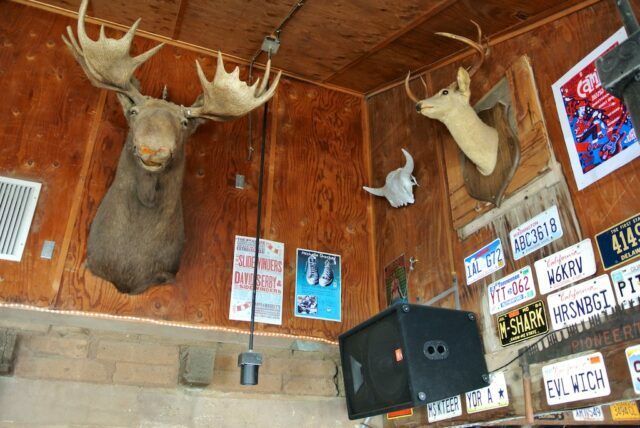 The legendary bar has become an indie rock favorite with a vibe that can’t be matched. Pappy&Harriet’s continues the tradition of live music, great barbeque, and good times in memory of Pappy and all those who came before him. One of the best things about visiting here is the design of the restaurant. 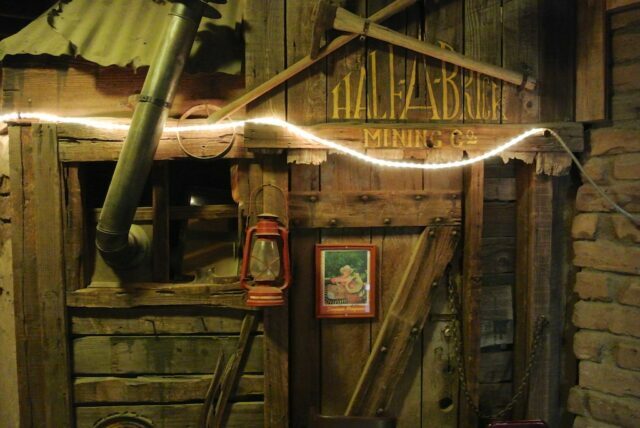 It feels like an old saloon when you stop in with all of the old world style and unique wooden artifacts. A lot of time was taken to create this atmosphere and it makes for a great place to relax. The stage itself is small which adds to the experience that is created when bands as big as the ones mentioned above come through to play. 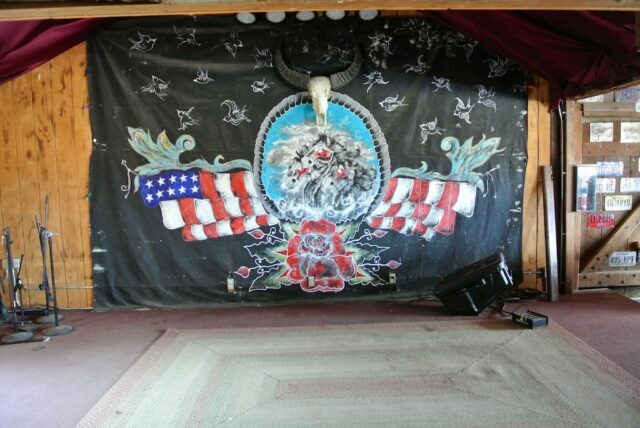 The stage is also only a foot or so off the ground so you can imagine what it would be like to see someone like Robert Plant here. 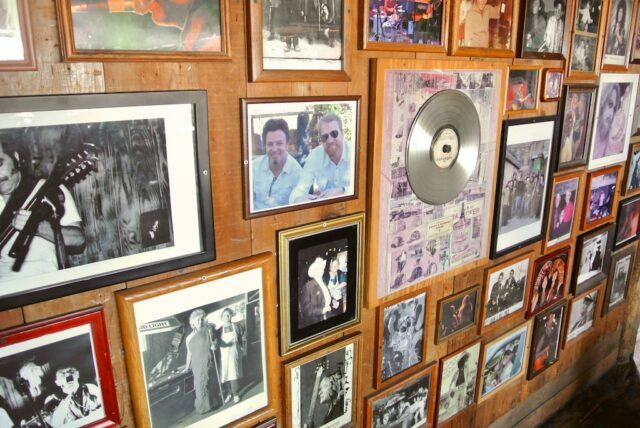 There is also a shrine on one wall will all of the bands and actors that have come through over the years and it includes a lot of famous people. In the back they have a couple pool tables near the bar so you can partake in some pool if you feel so inclined. The bathrooms themselves have some awesome paintings on the doors and insides as well. 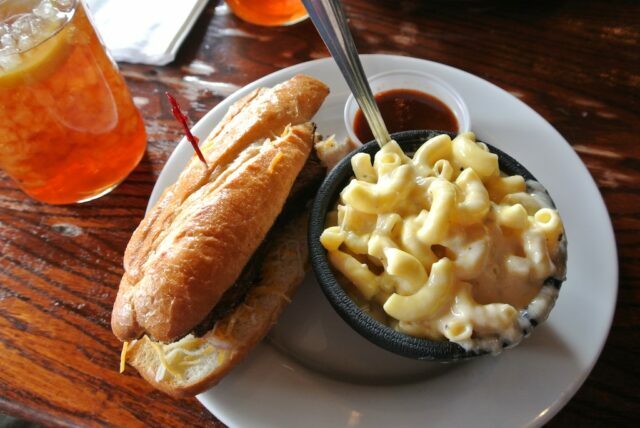 I was excited to try the BBQ that I could smell as soon as I got out of my car so I had the tri tip sandwich with the side of mac and cheese. I have to say the mac and cheese may be the best I have ever had as it was so rich and flavorful. A super unique taste. The tri tip sandwich was great as well with a really good BBQ sauce to dip it in and onions on top. 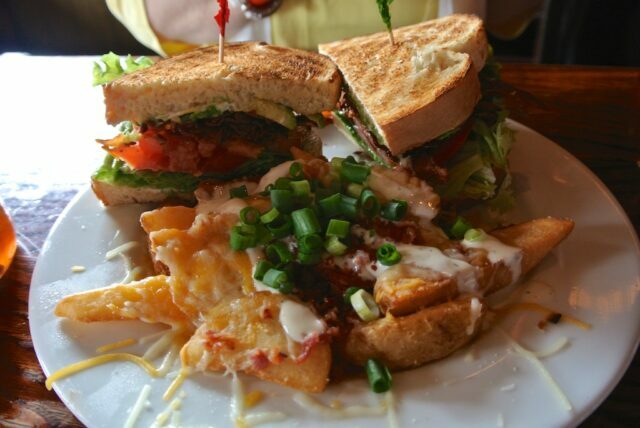 My mom got the BLT with cheesy fries, which is like a cheesy potato, she liked it a lot as well and I imagine you really can’t go wrong with the options here. Also, the drinks come in big mason jars which I love as it keeps them from constantly needing refills. This place is really a fun experience. After eating you can even walk through the replica main street that makes up Pioneertown. Now while it is pretty out-of-the-way for most people, if you are heading to Joshua Tree it is a great place to stop for lunch or dinner. 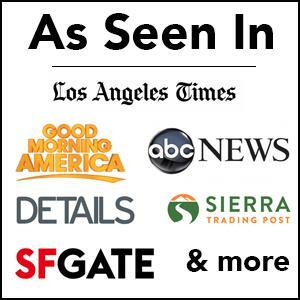 Check it out and let me know what you think in the comments.